FOR ALL AGES AND ABILITIES! Come and experience spraying stencil art first-hand, and spray your own artwork(s). This is a fantastic opportunity to take advantage of our facilities and spray yourself your own artwork using our laser cut stencils and ‘safe’ water-based spray paints. All abilities and ages can have a go, as these sessions are geared towards offering a chance to ‘get your hands on the cans’, a level 1 experience for everyone, plus you get a souvenir artwork or artworks to take home. “Criminally good fun! !” The Independent newspaper. All of the materials are supplied by us, allowing you to concentrate on selecting the best colours for the perfect stencil artwork, developing your can control as you spray your artwork. The artworks are created on A2 art paper which is 59 cm by 42cm. The ticket price includes attendance at the session for the opportunity to spray your own artwork. The A2-sized prints happen to fit perfectly into standard picture frames from most retailers. 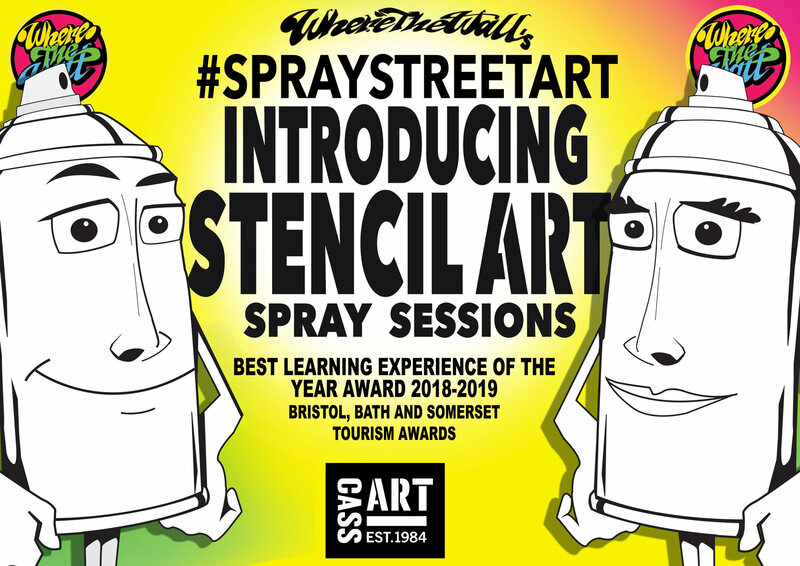 At the Bristol, Bath and Somerset Tourism Awards 2018, these ‘Introducing Stencil Art Spray Sessions’ won the silver award for Best Learning Experience of the Year. If you get a taste for creating stencil art, you can keep on going and create additional artworks at only £5 extra per artwork. Click here for adding additional artworks to your cart, or you can pay on the day. The spray session takes place at Hamilton House, 80 Stokes Croft, Bristol. BS1 3QY. and will be held indoors.